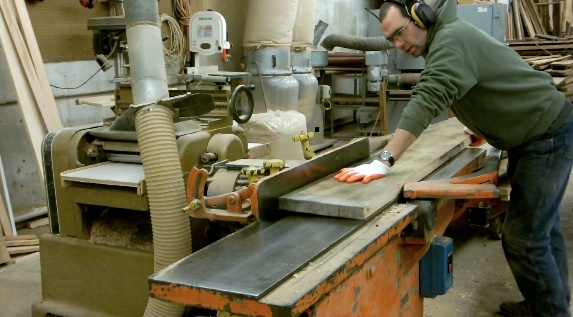 Whenever I put a new blade on my sawmill, I fold up the old one to send it out for sharpening. I don’t find the process as awesome as I used to, but it still seems to intrigue others that haven’t seen me do it before. And, I must admit, when I know someone is watching that hasn’t seen me fold up a bandsaw blade before, I do it extra fast and super snappy to make it seem even more dazzling. 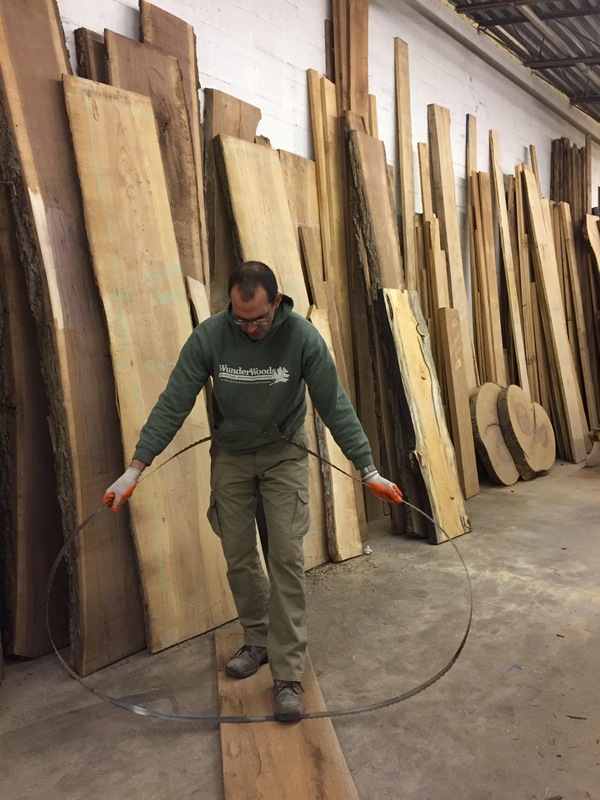 With a quick flick of my wrists, the 50″ diameter loop of bandsaw blade is reduced to three loops at just 17″, making it easier to handle and ship out. 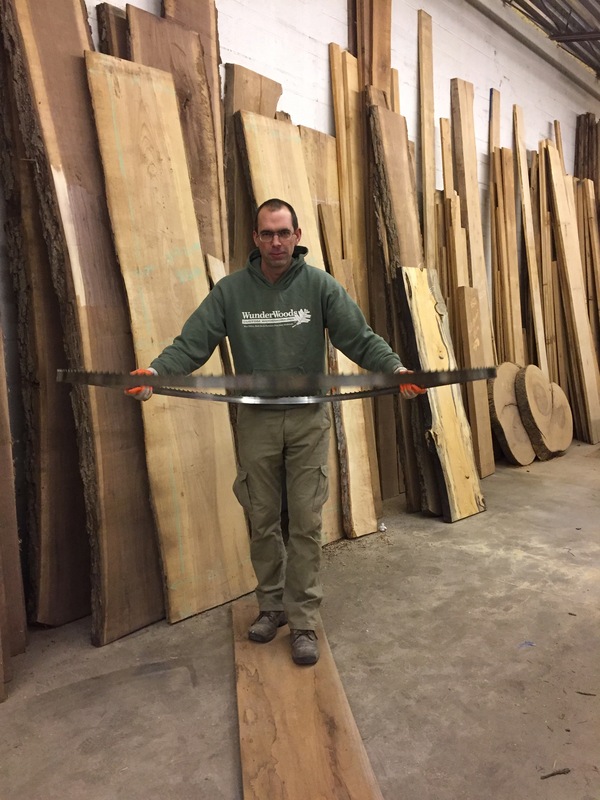 I learned how to coil a bandsaw blade like this pre-YouTube and over the phone from the kids at Wood-Mizer, who supply and sharpen my blades. It took a few tries to do it the first time and many more to get good at it, but I figured if I could learn it over the phone then I could certainly show others how to do it with visuals. The good news is that like learning to ride a bike, once you get it, you’ve got it. It all starts with a pair of gloves and holding the blade with the teeth facing up. To prepare, put on some gloves (without holes). Start by holding the blade with each of your hands on the outside of the blade, away from your body and parallel to the ground with the teeth facing up. Imagine that you are holding out a large basketball hoop in front of you waiting for someone else to take a shot. From there, whip the portion of the blade furthest from you towards the ground and just as the blade nears the ground give it a quick jerk up, with a snap. This motion will make the blade start to fold in half, with the teeth going away from you. At the same time that the blade starts to fold in half, simply twist both of your wrists towards the inside of the loop. If your timing is right, you will get to a certain point where the blade no longer wants to fight you and then it will just spring into three loops. When first learning to coil a bandsaw blade, you can cheat by using the ground to help you get started. When you are first learning this technique you may find it helpful to get a feel for it by cheating a bit. Start just as described above while standing on carpeting or grass or some other surface that is soft and will grab the teeth of the saw blade (I show it in the photos using a piece of lumber). Now, instead of whipping the blade towards the ground, just drop the end furthest away from you to the ground, so that the blade is now perpendicular to the ground. Use the soft and grabby surface to snag the teeth as you start to lift and push the blade up an away from you. Instead of getting the blade to fold in half with a whip motion, you are now going to get it to fold by pushing against the soft floor. As the blade starts to fold in half, with the teeth away from you, roll your wrists to the inside of the loop, just like described above. Using this method, you will be able to feel the exact point where the blade stops fighting you and happily coils into three loops. You should be able to get a feel for it after just a few times with this “cheating” method and then move on to the fancy, snappy method. As the front of the blade starts to fold down and towards you, twist your wrists and push towards the inside of the the loop. When your hands move to the inside of the loop, the back of the blade (closest to you) will curve down. After a certain point the blade will jump into three loops and stay there. Now you’ve got it! Hi! My name is Scott Wunder and I am the owner of WunderWoods Custom Woodworking. We build wine cellars, built-ins and furniture from local woods, here in St. Louis, MO. 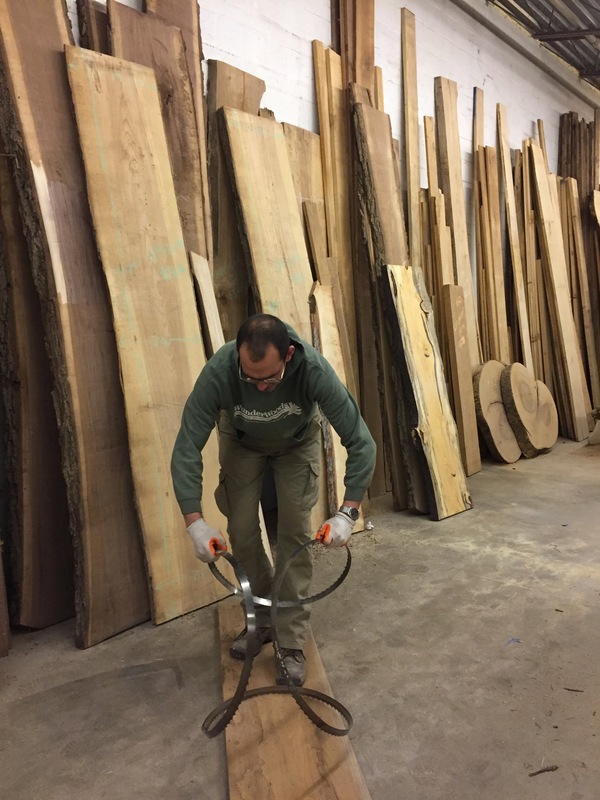 Recently, I finished a three-year term as the President of the St. Louis Woodworkers Guild, which had me writing a monthly article for our newsletter. 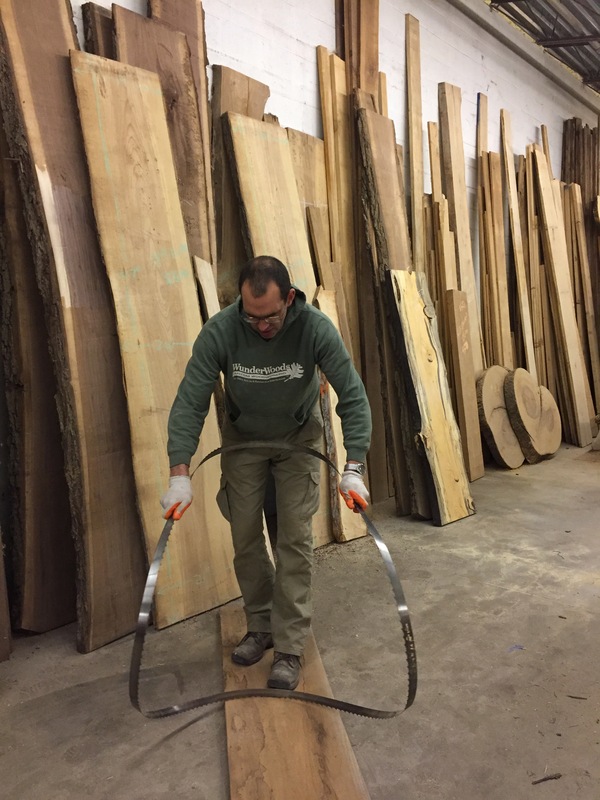 I love to write, especially about wood, and found that I still had more to say. 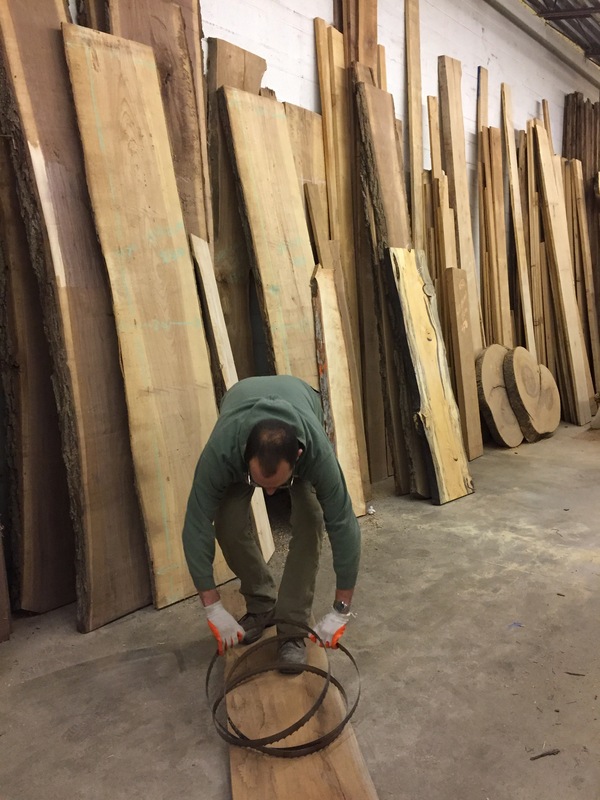 Every day I run into something wood related that I realize some of my customers don't know and this seems like a great forum for sharing what I have learned (instead of telling the same story to each person). The main thing to remember is that I try to keep it light and as my wife always reminds people that have just met me, "He is joking." I always have to refer to my bandsaw manual to get it right. Open for retail sales of lumber and slabs from 8 a.m. - Noon on Saturdays and by appointment during the week. Call Scott at 314-574-6036. Everyone always asks what I do. Here's the answer. Click on the photo above for a short video tour and see all of the steps it takes to go from a tree to finished furniture.